This easy prime rib with au jus recipe and *perfect* creamy horseradish sauce is perfect for the holidays! This easy prime rib recipe is truly just that: super easy, and it produces a perfect medium rare, tender roast that everyone will love. 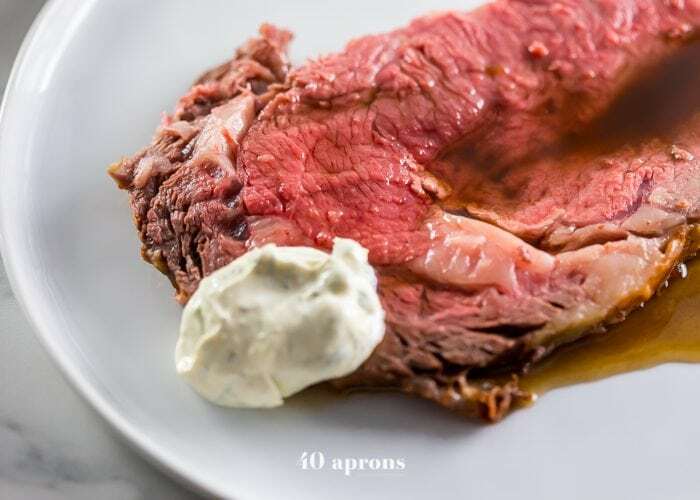 With an easy au jus recipe and the most perfect creamy horseradish sauce I’ve ever tasted, this easy prime rib recipe also has options to make it a paleo prime rib or Whole30 prime rib, too – even the horseradish sauce! We started a new Christmas Eve tradition last year, and I’m kind of into it. Growing up, it was always the same. Usually, we were coming in to Memphis from out of town, flying in from Phoenix or lurching tiredly over the last corner of Tennessee, having driven 12 hours in a day from the East Coast. The extended family would gather in my great aunt’s house in Midtown Memphis, and we’d eat spaghetti with meat sauce, heavy on the garlic bread for for the kiddos, finished off with a slice of boozy rum cake that probably helped us fall asleep faster, despite the anxiety for Christmas morning heaving through our veins. We wrote Santa weeks back, letting him know that we’d need him to come a bit early since we’d be traveling on Christmas Day. We’d have already opened our big presents, our white-and-pink bicycles and our copies of The Oregon Trail on CD-ROM and our battery-operated board games. Family Christmas and its Christmas Eve, then, were a bit underwhelming, filled with lots of requisite hugs and waiting for dishes to be cleaned and scooting around an overcrowded house with a bunch of cousins we hardly remembered. And even after we moved to Memphis and turned our own family Christmas back to the 25th, the spaghetti-garlic-bread-rum-cake routine continued. Years later, though, when I met my husband, things naturally changed. I was invited to his family’s Christmas Eve celebration, and we sat with our legs curled up under us by the fire, watching his niece and nephew throw discarded wrapping paper in the air and run around underneath it. We ate swanky pizza, and I nervously gave gifts to people I hardly knew, hoping they’d like me. I skipped my family’s spaghetti tradition as we made our own. Since we’ve been married, though, it’s all changed. Steeped in holiday family obligations, we decided to reclaim Christmas Eve for ourselves, making a lavish dinner and giving each other our gifts, sitting on the floor next to the Christmas tree in sweats, taking iPhone photos of each other opening the surprises we’d wrapped, sipping Cabernet from the glass on the floor next to us. Last year, with Leo being old enough to actually, you know, rip paper, we invited my father in law over, made prime rib, let Leo maniacally destroy our wrapping jobs, then made hot chocolate, and watched the Curious George Christmas special. It was perfection. Since then, it’s been decided: every year will be Christmas cookies for Santa, followed by a prime rib dinner, finished with hot chocolate, Christmas jammies, and a movie. Cozy and festive, right? I seriously can’t wait. That’s why I’m sharing my perfect and easy prime rib recipe with au jus and horseradish sauce! Knowing that you’ll have family to feed, your house buzzing with activity. This easy prime rib is just that: the easiest. It’s also quite quick, meaning you don’t have to plan 8 hours ahead, because, let’s face it, that just doesn’t always work, right? How long do I cook prime rib for medium rare? This easy prime rib recipe is so tender and perfectly medium-rare, thanks to the use of a meat thermometer. 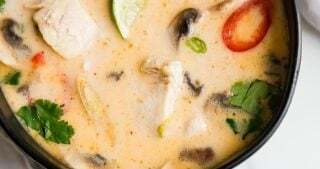 It goes like this: put it in the oven at one temperature, lower the temperature, and when the thermometer beeps, take it out. Simple as it gets, right? I tried a couple other methods first, before perfecting this easy prime rib recipe, and I can assure you: this is the most tender and all-around best prime rib I’ve had at home. Or maybe… anywhere? Big claim! So focus less on the time it takes to cook this prime rib and more on the thermometer! 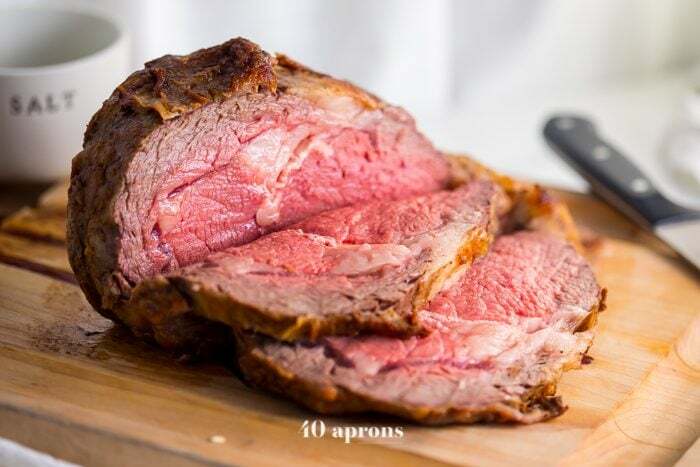 You’ll cook the prime rib for 15 minutes at 450º, then reduce heat to 325º F. You’ll cook it until internal temperature is 113-115º F for very medium rare. The roast will continue cooking after removing from oven when you let it rest 20 minutes while you make the au jus. And that au jus recipe! The au jus to go with this easy prime rib recipe is equally easy: stir in a few things, let it simmer a bit, and voilà: rich and flavorful au jus to serve alongside your roast. I will literally drink a good au jus, and this au jus recipe is super easy, quick, and oh so savory. You might be used to au jus from the little bottle at the store but it’s so, so much better made at home. How do you make au jus at home? 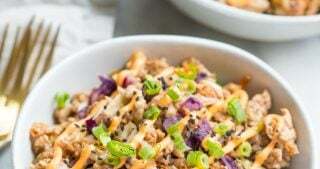 This au jus recipe is way easier than even making a little packet! To the pan after you’ve removed the prime rib, add Worcestershire sauce and red wine and reduce slightly, by about 1/4. Add beef broth and continue to simmer until reduced to desired consistency. Carefully tilt roasting pan and, using a spoon, discard excess fat floating on top. 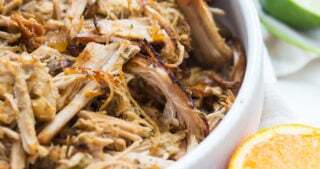 Carve roast and serve with the au jus recipe! The most magical part of it all, though? The horseradish sauce. Holy. Oprah. Something magical happens when you let these ingredients blend in the fridge. I let the sauce chill a couple hours, and it was great, but 24 hours later? It was next level. I even scooped a blob onto Leo’s plate and he ate the entire thing off his fingertip until it was gone. 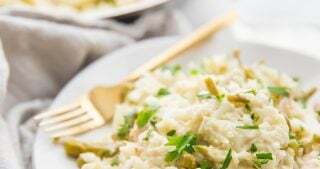 Toddler-pleasing horseradish sauce? It’s a reality, y’all. I highly recommend letting the sauce chill for 24 hours before serving, but if you can’t swing that, give it at least 1 hour in the fridge. You’ll get it when you taste the stuff! Make the horseradish sauce first: simply stir together all the ingredients and let the mixture chill at least an hour, preferably longer. 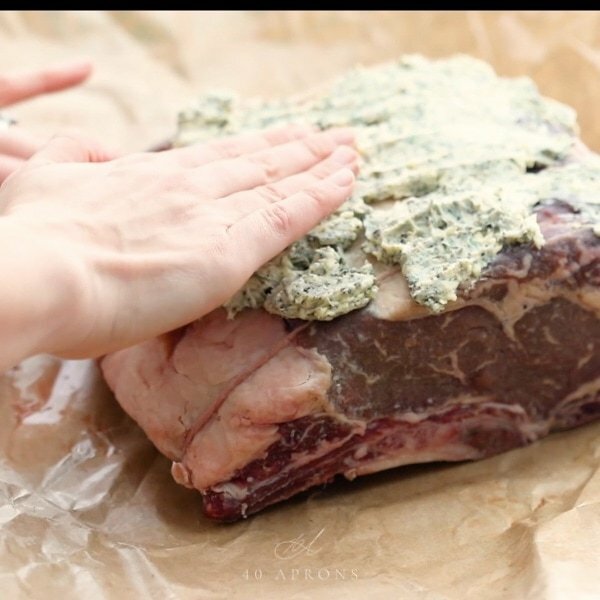 Preheat your oven to 450º and sprinkle all the sides of the prime rib with salt and lots of freshly cracked black pepper. Pat softened butter over the the top. Place the prime rib in a roasting pan and place in the oven. 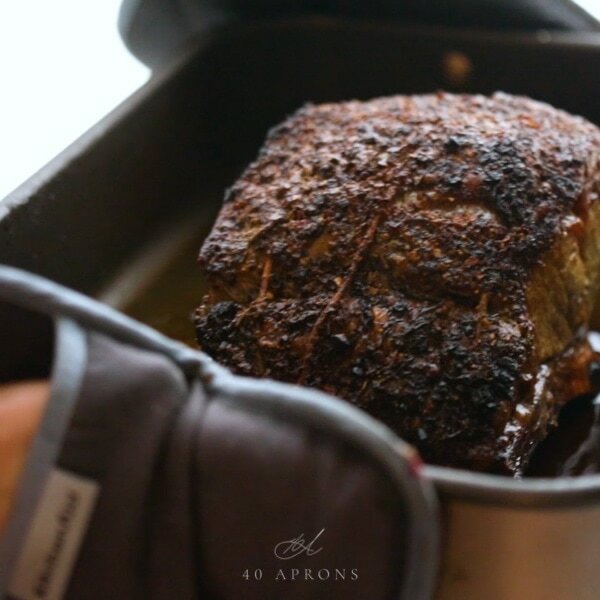 After 15 minutes, reduce the heat to 325º F. Insert a meat thermometer into the center of the roast and roast until the internal temperature is 113-115º F for very medium rare. 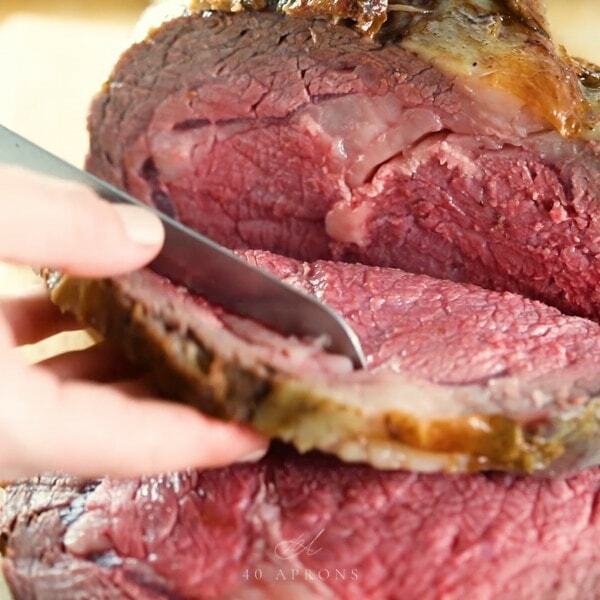 Don’t worry – the prime rib will continue to cook after you take it out of the oven. Baste the prime rib every 30 minutes with the fat thats dripped into the pan, and when the roast reaches the desired temperature, remove it and transfer to a cutting board. Let rest 20 minutes while you make the au jus. 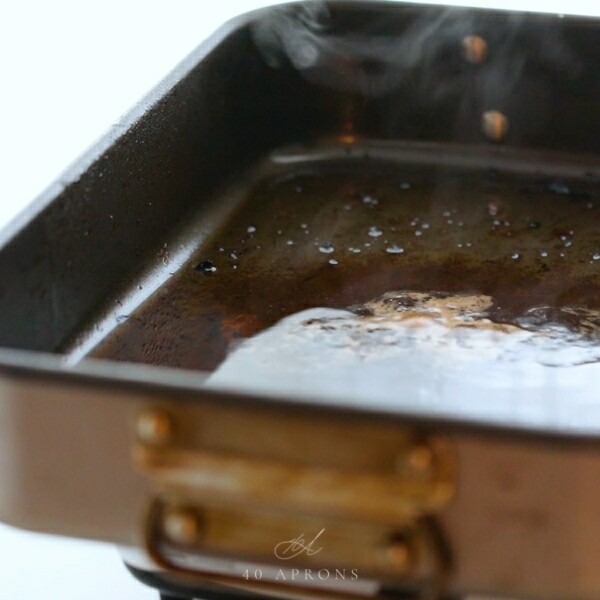 Place the roasting pan on the stove over medium-low heat. Pour in Worcestershire sauce and red wine; reduce slightly, by about a quarter. Add in the beef broth and simmer until slightly reduced to desired consistency. Tilt the roasting pan and carefully skim off excess fat floating on top. 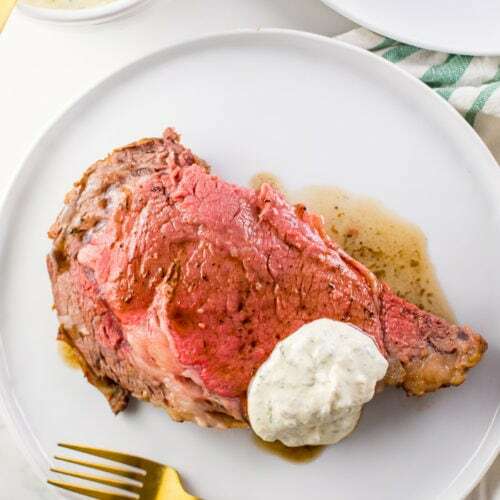 Carve your prime rib and serve with lots of this au jus recipe and creamy horseradish sauce! 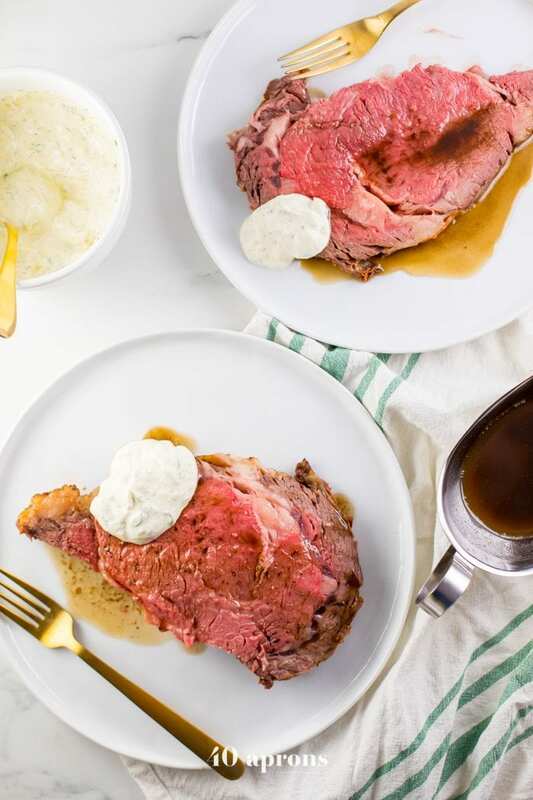 This easy prime rib recipe with au jus and *perfect* creamy horseradish sauce is perfect for the holidays! This easy prime rib recipe is truly just that: super easy, and it produces a perfect medium rare, tender roast that everyone will love. 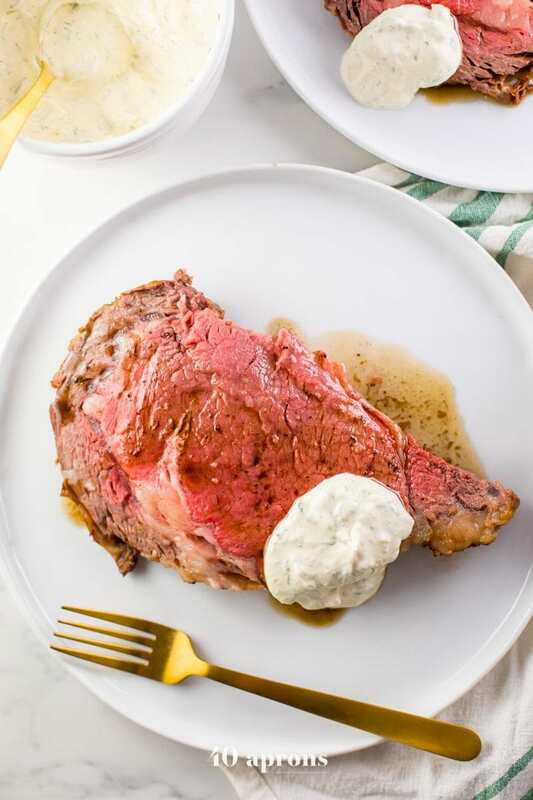 With an easy au jus and the most perfect creamy horseradish sauce I've ever tasted, this easy prime rib recipe also has options to make it a paleo prime rib or Whole30 prime rib, too - even the horseradish sauce! This recipe includes an optional garlic-rosemary crust. The roast is delicious with just salt, pepper, and butter, but the garlic and rosemary are so flavorful. Either way, you'll have a delicious prime rib! 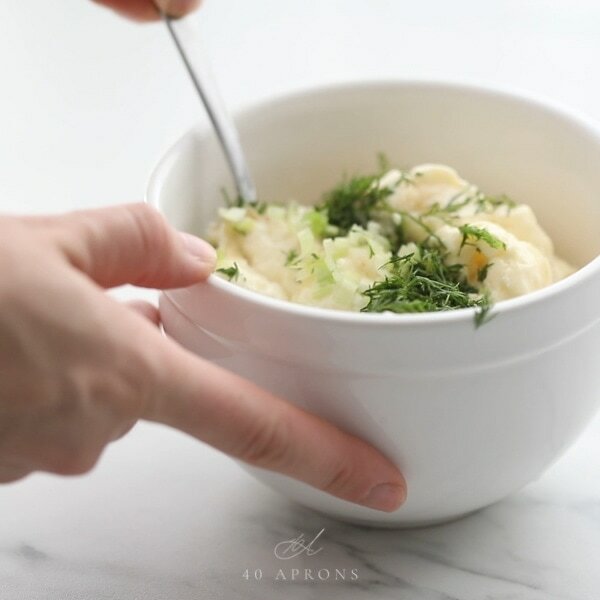 Make the horseradish sauce ahead: stir together all ingredients and chill at least one hour, preferably overnight. If making paleo or Whole30 version, see note. Roast does not need to come to room temperature. Preheat oven to 450º F. Sprinkle all sides liberally with salt, then generously crack fresh black pepper over. If making garlic-rosemary crust, in a small bowl, stir together softened butter or ghee, minced garlic, and rosemary, then pat evenly over roast. If not using crust, simply pat softened butter over roast. Place in roasting pan and put in oven. Cook for 15 minutes, then reduce heat to 325º F. Insert a meat thermometer into the center of the roast and cook until internal temperature is 113-115º F for very medium rare. Roast will continue cooking after removing from oven. Baste roast every 30 minutes using a culinary brush with the fat that's dripped into the pan. When roast reaches desired temperature, remove roast from the oven, transfer the roast carefully to a cutting board, and let rest 20 minutes while you make the au jus. Place the roasting pan on the stove over medium-low heat. Add Worcestershire sauce and red wine and reduce slightly, by about 1/4. 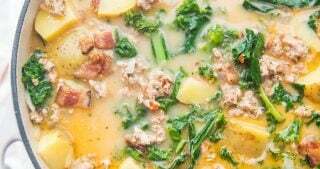 Add beef broth and continue to simmer until reduced to desired consistency. Carefully tilt roasting pan and, using a spoon, discard excess fat floating on top. Carve roast and serve with au jus and horseradish sauce. 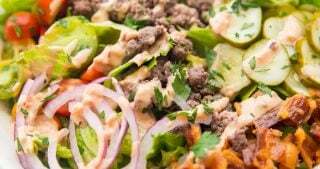 If on a Whole30, make sure your Dijon mustard is Whole30-compliant. 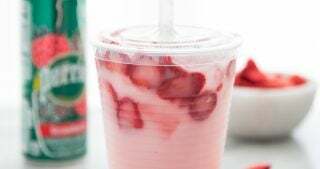 Annie's makes a compliant version, and it's readily available at many grocery stores. 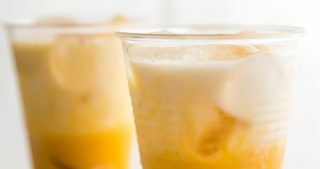 Combine all ingredients in a high-speed blender and blend until completely smooth. 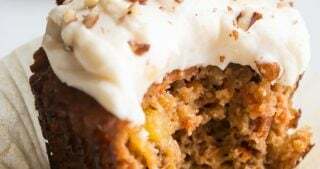 Continue with recipe. I love the recipe but wonder about how long it should roast per pound. I can’t just stick it in the oven and guess when I have other things to cook. 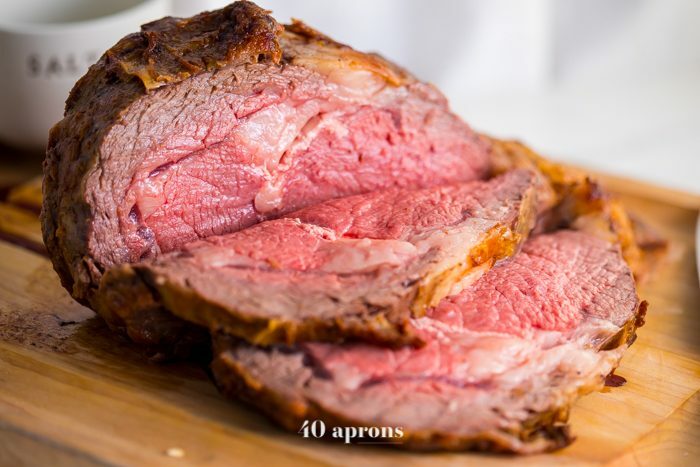 What size should the prime rib roast be? Thanks. Checked on TFM web site and their recipe called for a 6-8 pound roast. So, looks like a 5-8 pound one would be nice. 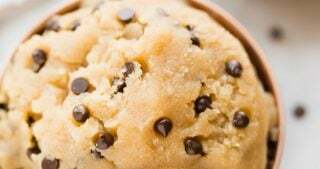 You kind of need to know roughly how long per pound. I’m doing 11 lbs. But I don’t think they cook at the same rate.